THE ALL-NEW DS3 RANGE STARTS AT JUST �,700 for the petrol VTi 95bhp DSign, rising to �,900 for the top-of-the-range petrol THP 150bhp and diesel HDi 110bhp DSport models. In all there are five Euro V compliant engine choices: three BMW co-developed petrol units (1.4-litre 95bhp, 1.6-litre 120 and 150bhp) and two modern Citro雗 HDi 1.6-litre diesels with power outputs of 90 and 110bhp. An auto transmission option will follow soon. 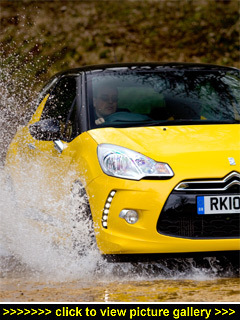 Equally as important as the purchase prices are the running costs  and DS3 customers will be able to take advantage of a fixed price servicing offer: costing �9, this covers all recommended and scheduled servicing and brake fluid replacement for up to 3 years / 35,000 miles. For good measure, depending on the engine emissions, road tax ranges from £0 to �5 and if it is a company supplied car then Benefit-in-Kind tax ranges from 13 to 19 per cent. Insurance costs are also competitive: 12E to 22E on the new 1-50 scale. And while costs might be low, safety is high thanks to a top five-star EuroNCAP rating. DS3 is available in three trim levels: DSign, DStyle and DSport. An environmentally-considerate DStyle 99g version  equipped with a new version of the 90bhp diesel engine  is also available and, as its name suggests, this models emits just 99g/km of CO2. With the eye-catching, three-door DS3 styling as standard, DSign models are far from being a basic proposition  not the case with many competitors' entry-level models in this class. The DSign trim features generous levels of standard equipment including leather-wrapped steering wheel, an MP3-compatible CD player with steering-mounted controls, front fog lights, electric door mirrors, cruise control with speed limiter, ESP stability programme, six airbags, electric windows, remote central locking and Gear Efficiency Indicator. or so well put together. At the heart of the range, DStyle models gain striking front bumper-mounted LED lights, air-conditioning, dark-tinted rear windows, contrasting body and roof colours, roof-coloured painted door mirrors with a chrome base, shiny-finish black dashboard and 16-inch diamond-tipped alloy wheels. The DStyle 99g version is based on the DStyle trim but externally the only difference is the use of 16-inch steel wheels with wheel covers in place of the DStyle's 16-inch alloys. Combining classy touches with sporty styling, DSport models feature chrome side rubbing strips, a rear spoiler with an integrated third brake light, chrome double exhaust pipe, drilled aluminium pedals and 17-inch black diamond-tipped alloys. The 'Connect Signature' pack, which includes Bluetooth, USB socket and the eight-speaker Hi-Fi system, is standard specification, as is automatic digital air-conditioning. But the individual ownership proposition doesn't stop there: Citroen say each DS3 experience is unique, because each car is designed for the individual, by the individual. With a comprehensive choice of customizing options  unusual for a new car by a mainstream manufacturer  each DS3 can be tailored to a driver's own individual performance, style and technology preferences. There are 38 body and roof colour combinations to choose from, whilst door mirrors, wheels and wheel centre caps are available in a vast range of colours and combinations. DS3 even offers a selection of 'Spirits'; these include stylish roof graphics and matching carpet mats. My test car had a black roof covered with white spots and looked as if it had been 'spotted' by seagulls. Distinctive for sure! Inside, drivers can choose from several different colours of cloths and premium leathers, with the dashboard available in up to six finishes including red, blue, white and even aluminium and carbon-fibre effects. The gearstick knob is also offered in several different colours, which blend with satin-finished chrome. Using a special DS3 'configurator', the DS3 personalisation process starts with customers selecting their preferred engine and trim level. Depending on their initial choices, they are then presented with a choice of body colours, roof colours and roof graphics, as well as a host of other features to select from  such as chrome door mirrors and chrome rubbing strips; alloy wheels in different sizes, styles and colours; front bumper LEDs; upholstery materials; and the colour schemes of the dashboard and gear knob. There are also equipment 'signature' packs to choose from, which include 'executive' car features such as automatic headlamps, rear parking sensors, MyWay satellite navigation, Connecting Box (Bluetooth with USB socket) and a front central armrest. As a reminder of the bespoke nature of DS3 ownership, a disc mounted in each key fob is finished in the same colour as either the car's body or roof. Having missed the usual motoring media 'first test drive' event due to a long-booked holiday, when the DSport specification DS3 test car arrived on my driveway I was surprised. Not just because of its very smart and distinctive styling but even more so by the quality and design of the interior. This model has certainly moved into the same classy arena as the very top specification MINI Coopers. I have to admit I was not expecting the DS3 to be so smart or so well put together. In my life of testing new cars on a daily basis you get to know what to expect. The DS3 has proved that theory to be wrong, at least in this case. But not only did the DS3 look and feel good, but it also drove beautifully. It does not have the precise, kart-like handling performance of the MINI but then it does have a far more compliant and comfortable ride. On the move it feels well balanced with plenty of predictable grip  and it was very civilized to drive. The 1.6-litre, four-cylinder engine, boosted by a turbocharger, produces 150bhp but more importantly 177lb ft of torque from just 1,400rpm so it is very responsive from low speeds, requiring the minimum of use from the six-speed manual gearbox. I have to commend the quality of the gearchange, which is silky smooth and precise, and the gear ratios are perfect for real-life driving. The fuel economy during my test drive week was an acceptable 39mpg and not far short of the official 42.2mpg figure. Top speed is an impressive 133mph and the zero to 62mph dash takes 7.3 seconds.